Many Years to our Newly Elected Metropolitan TIKHON! 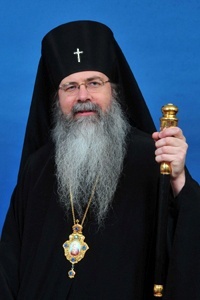 As a parish we want to wish our newly elected Primate, His Beatitude Metropolitan TIKHON, Many Years! May the Lord bless Your Beatitude’s ministry to His Holy Church. Be assured of our prayers! Archbishop Tikhon, Archbishop of Philadelphia and Eastern Pennsylvania, was elected Primate of the Orthodox Church in America during the 17th All-American Councilof the Orthodox Church in America at Holy Trinity Church here Tuesday, November 13, 2012. Six hundred and sixty three hierarchs, clergy and lay delegates and observers representing OCA parishes across the US, Canada and Alaska participated in the Council. Five hundred and ninety were eligible to vote. The Council opened with the celebration of the Divine Liturgy and, at noon, the plenary session. After the celebration of a Service of Thanksgiving and the singing of the troparion invoking the Holy Spirit, Archpriest Eric G. Tosi, OCA Secretary, opened the plenary session. No single candidate received the required two-thirds margin on the first ballot. On the second ballot, His Eminence, Archbishop Tikhon of Philadelphia and Eastern Pennsylvania and His Grace, Bishop Michael of New York and New Jersey, received 317 and 355 votes respectively. The members of the Holy Synod retired into the altar where they elected Archbishop Tikhon. ← Why do We Fast before Nativity?